Home »TV»Deadshirt is Watching»Deadshirt is Watching… Aquarius, Amy Schumer, & WWE! Deadshirt is Watching… Aquarius, Amy Schumer, & WWE! Deadshirt Is Watching… is a weekly feature in which Deadshirt staff, contributors, and guests sound off on the television shows we’re tuned into, from intense dramas to clever sitcoms to the most insane reality shows. This week: Aquarius, WWE Elimination Chamber, and Inside Amy Schumer! Aquarius is a frustrating show for me, and I think a big part of the problem was in the way it was promoted. From the trailers I’d seen (and slogans like that above), I believe Aquarius to be the story of Charles Manson and the detective who hunts him down. And it is, sort of, but it’s not the true story, because Aquarius is pure fiction. And while a hard-boiled cop show set in 1967 could be a lot of fun, the fact that it insists on hanging itself on a loose interpretation of a very real figure cheapens the whole thing significantly. The main storyline concerns Sam Hodiak (David Duchovny in full David Duchovny), an older cop who doesn’t quite jibe with the young kids these days. He teams up with hot young cop (emphasis on hot) Brian Shafe (Grey Damon) to solve crimes, among them the disappearance of a young girl who has run off to live with, you guessed it, Charles Manson. The Emma-and-Charles show is the B-plot, and it’s about as interesting as bread. I’m not so much upset by the fictionalization of Manson as the lack of effort into his characterization. Manson is a horror figure of pop culture, much like Hannibal Lecter, and oh wouldn’t it have been so cool to get a show that delivered the same kind of gruesome character study. But Gethin Anthony’s Manson isn’t particularly original or exciting, and it certainly doesn’t help shed light on what brought him such a devout following. The depiction of Manson and his harem-commune is like a less-explained version of Orphan Black‘s Prolethians, and that’s saying something. The Sansa Stark-esque Emma Dumont, who plays the character of the same name, has a fascinating face, but hasn’t been given much material to show her chops with. 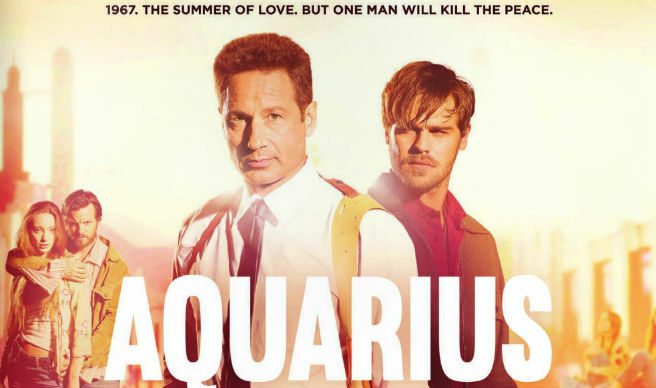 If the whole show were Duchovny and Damon teamed up, Walter-and-Jesse style, for a loudly sixties buddy cop noir, Aquarius could be really fun. Instead we just have a bunch of watered-down Charles Manson fanfiction, and it’s a bummer. Episode Highlight: Duchovny is always Duchovny, no matter where you stick him, but it is funny watching him take on the role of the straight and gruff old-timer when he’s always been the cocky upstart. We’ll see if Damon can step up into that role as well. Also, if you’re the binging type, the whole first season is available to watch free for a limited time. But I gotta be honest—I’m not taking the bait. Read more from Haley and follow her @winterzzzzzzz! As our own Dominic Griffin has explained in his wrestling column, John Cena is essentially the Captain America of wrestling. He’s a bit of an old-fashioned “say your prayers and take your vitamins” type character, standing up for vague middle American values like “respect” and “hustle,” giving rousing speeches about never giving up, and doing a lot of charity work. He’s been the square-jawed, clean-shaven face of World Wrestling Entertainment for the past decade, a life-sized action figure. So, of course, wrestling die-hards hate his guts. Enter Kevin Owens, a fifteen-year veteran of the indie wrestling circuit, lately of NXT, WWE’s own indie-style minor league promotion. Where Cena is clean cut and chiseled out of marble, Owens is grizzly, stocky, human. At Elimination Chamber, Owens exploded into the WWE Universe to challenge Cena for the US title—not because he wanted the belt, but to prove that his NXT title is the real thing. And, for the next half-hour, that’s exactly what he did, as the pair of champions delivered one of the most epic and exciting matches of the year. What’s so compelling about Kevin Owens as a character is that he doesn’t seem at all like he’s playing a character. He’s an anti-hero—disrespectful, arrogant but skilled as hell, bitter and angry over having to work so hard for so long to get to the big time while pretty boys like Cena have been raking in millions—and I completely buy that it’s real. He’s not like current Top Heel Seth Rollins, who’s a comical over-the-top jackass; nor is he like classic anti-heroes like the raunchy and raucous Shawn Michaels or the larger-than-life badass Stone Cold Steve Austin. Kevin Owens is a guy you know, and he scares you, because you really don’t know what he’s capable of. He’s gonna get what he thinks he deserves, and so are you if you get in his way. There were six other matches on the card for Elimination Chamber, and some of them were fantastic, but Cena vs. Owens is the one that’ll go down in the history books. Episode Highlight: You mean apart from the Owens match? Well, for one, my favorite Lucha Dragon Kalisto climbed the steel chain walls of the Elimination Chamber and dropped on a bunch of guys from the ceiling. Read more from Dylan and follow him @DylanRoth! This season of Inside Amy Schumer has been a revelation. While the show has always been funny, it hit a new level this year, with a marked increase in clever, incisive takedowns of sexism and patriarchal concepts in a variety of forms. Nearly every week balances absurdity and insight in equal measures, and it’s clear that the sketch comedy’s writers room and production staff have decided they’ve put in enough work to secure their base that they can really take the gloves off. “The Court of Public Opinion” was a very solid, close-to-home jab, and while nothing this week quite reached the level of all-time greats like “Last Fuckable Day” or the 12 Angry Men parody, it’s still a season in which even the B-list sketches are on par with some of the best creator-driven sketch shows of the past decade. Episode Highlight: Okay, I’m an easy mark, but “The Universe” was pretty much non-stop funny. Schumer herself has shown a willingness to step out of the spotlight of sketches this season that I haven’t really seen from stars like Nick Kroll, Demitri Martin, or even Key and Peele, and it allows for a wider breadth of parody. Seeing the stars of my favorite Comedy Central show, Abbi Jacobson and Ilana Glazer, made my heart leap, and it was a treat that the fun uncle of the nineties, Bill Nye, is not above swearing and poking fun at his image a little bit. Read more from Joe and follow him at @joestando! Next → Next post: Mind the Gap: You’ve Never Seen The Magnificent Seven?